Mont-Tremblant (QC), Canada – In 1938, Joseph Bondurant Ryan, a wealthy American from Philadelphia, and his radio journalist friend Lowell Thomas, climbed to the summit of Mont Tremblant in Quebec’s Laurentian Mountains, using skis wrapped in seal skins. As the story goes, Ryan – who was ostensibly in the area to prospect for gold – took in the view from one of the highest summits in Quebec, and decided then and there to open a ski resort with a European-style mountain village at its base. A year later, he installed a single-chair lift and started construction on a base area modeled after the resorts of Europe. It was the first large ski lodge to open in Quebec. Thanks in part to his friend Thomas, who promoted the resort in his radio broadcasts, Mont Tremblant quickly became a popular destination. Today, though the mountain is owned by the corporate ski giant Intrawest, Tremblant continues to offer a low-key, European mountain vibe. Only two hours’ drive from the New York State border (sans Montreal traffic) it feels a continent away. 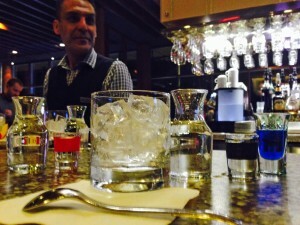 Maybe it’s the subtle things — the omnipresent poutine (French fries with cheese curds and brown gravy) or the single-serve bottles of wine sold in the cafeterias, complete with stemmed glassware. Or, of course, the French spoken everywhere, though it seemed every other skier used English, and many Quebecois are bilingual. 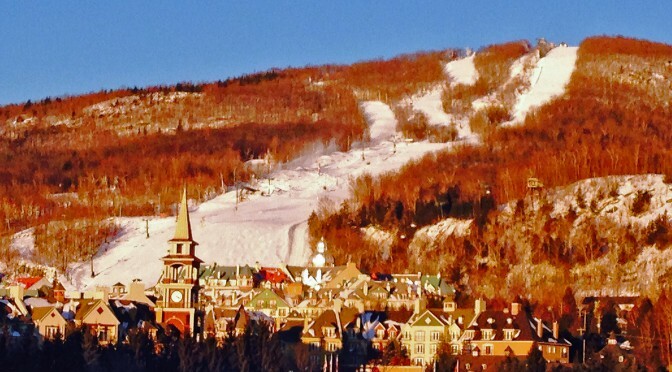 Perhaps it’s just that, like Quebec itself, Tremblant is a place that straddles two worlds. 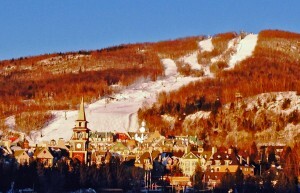 Of course, if you don’t care about the culture, know this: Tremblant also skis big. I visited the mountain on a four-day trip this month, sampling the downhill and cross-country opportunities as well as the dining and nightlife (or as much as I could stay awake for after a full day on the slopes). While its 2,871-foot elevation seems diminutive compared to neighbors in the Adirondacks and Green Mountains, it sports a respectable 2,100 foot vertical drop and makes ample use of both south and north sides of the mountain. There are 95 trails, 14 lifts and, during my weekend visit, a lot of people. There is terrain for all level of skiers, although extreme skiers may be a bit bored. And if you’re not a serious snow sports fan, there’s plenty to do off the slopes as well. “Welcome to Quebec,” said one resort staffer when I mentioned my confusion. I stayed at the posh Sommet des Neiges, a hotel/condo complex at the top of Tremblant’s pedestrian village, which is so authentically Alpine you expect sheep-herders and their flock to wander by the hot tub. The vehicle-free streets slope downhill in several directions. Shops line the tiered walkways, including such Canadian icons as the SAQ (the government-owned liquor store) and BeaverTails, which is kind of a giant, flat donut with jam or Nutella on top – it’s good. A giant clock tower at the base and a free skating rink lit by colored lights at night complete the scene. It’s so darned charming that it’s easy to forget that nearly all of it was built by Intrawest in the past 25 years. 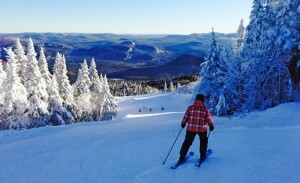 On our first morning skiing, we got up early – one benefit of staying in one of Tremblant’s 1,900 rooms is the “First Tracks” program, which allows skiers a chance to start at 7:45 a.m., 45 minutes earlier than the rest of the rabble. But a downside to said early mornings: the temperature. This is, after all, Canada. The locals have different ways of coping. I saw one young woman with mittens apparently made from raccoon skins. Others just make ample use of face masks and multiple layers. And I’ve never seen so many skiers in down jackets. One man was even clad in a puffy one-piece, the kind generally reserved for Everest summiteers, making him look like a kind of canary-yellow Michelin man. I was at Tremblant with several other ski writers, and as soon as we arrived on the summit, we joined up with a free guide – the mountain has nearly 100 volunteers who take newbies around. Ours was André Lachapelle, a talkative, retired Montreal native who has skied the mountain for 45 years. Lachapelle’s first tip: follow the sun. The “north side” area is also the east side, so spend your morning there to take advantage of what little solar warmth you can contrive. In the afternoon, hit the south side to catch the afternoon light. As we skied, Lachapelle gave us the history of the various trails. One was named for “Jackrabbit” Johannsen, considered the father of skiing in Quebec. “Cossak” is named for the signature move of local gold medalist Jean-Luc Brassard. “The Buzz,” a wide tree run, was named for the sweet smell that often emanated from skiers toking up in those hidden glades. Then there’s “Dynamite,” a trail so steep that Lachapelle admitted to never having skied it. We passed the route on our way up the Expo Express quad, and it was clear the headwall was both precipitous and rocky. One online aficionado describes it as a rarely open waterfall approaching 42 degrees. The trail was carved in the late 1990s for the Dynamite Extreme competition. The rules were simple: skiers ride up the chair and ski down Dynamite as fast as possible, jump back on the chairlift, and repeat. The skier with the most descents in four hours wins. The record, according to Lachapelle, was 57 thigh-burning runs, which he calculated at about a minute per descent. Andre had been a volunteer for that race, and he saw first-hand how exhausting it was – one competitor passed out in front of him while waiting for the chairlift, he said. On Saturday, the mountain was at its peak by 10 a.m. This was, after all, the best conditions they’d had so far this year. At the north side base area, there were enough people waiting for the summit quad that, with the proper management, the crowd could have spelled out letters visible from space (my choice would have been “mon dieu!”). The best way to avoid a 20-minute lift line is to not ski down to the bases, a strategy easily arranged thanks to a variety of mid-mountain lifts. Or better yet, wander over to Tremblant’s closest thing to a hidden treasure, the Edge Lift. This slow-moving quad accesses three black diamond runs, one of which was heavily mogulled. The best trail, Sensation Haut, offers a top-to-bottom glade run. The whole area was refreshingly quiet, and I spent a good 90 minutes lapping the trails as I waited for the crowd to thin elsewhere. If you’ve got any energy left after skiing the mountain, there’s plenty to do when the lifts stop spinning. At night there’s tubing and ice skating – free to hotel guests – and bonfire pits. Down the hill is Aquaclub, with its indoor and outdoor pools and Jacuzzis. There are plenty of eateries, ranging from pub fare to the elegant Gypsy, a tapas restaurant, and more formal places as well. One evening we took part in a guided snowshoe walk from the summit ($89 with rental). A large group of us wandered through the woods on a hiking trail, with guides at front and back. After an hour’s walk, we stopped in a log cabin for a long fondue dinner, washed down with wine. We returned to the base by 9 p.m., lit by moonlight and headlamps. The late-night crowd won’t be bored either, although anyone over 30 may find themselves feeling their age. The older folks hung out at Microbrasserie La Diable, named for a local river, while the college crowd – fueled by an 18-and-older drinking age – wandered jacketless through the 10ºF Canadian air, waiting on line at a club with pounding bass and occasionally peeing in inappropriate places. And then there’s the nearby casino, which is reachable via a free shuttle bus. There, you can have both a world-class dinner and a few hours of (potentially expensive) gaming entertainment. For those looking to do more than schuss, there is also dogsledding and cross-country skiing. 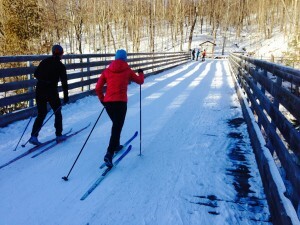 I sampled the latter at nearby Ski Du Fond, a 90-kilometer groomed cross-country area with trails that extended all the way back to Mont Tremblant. The routes were both scenic and challenging – one difficult run climbs up and over a small mountain, with a hill so steep there’s a bell for you to warn skiers below that you’re about to zoom past. 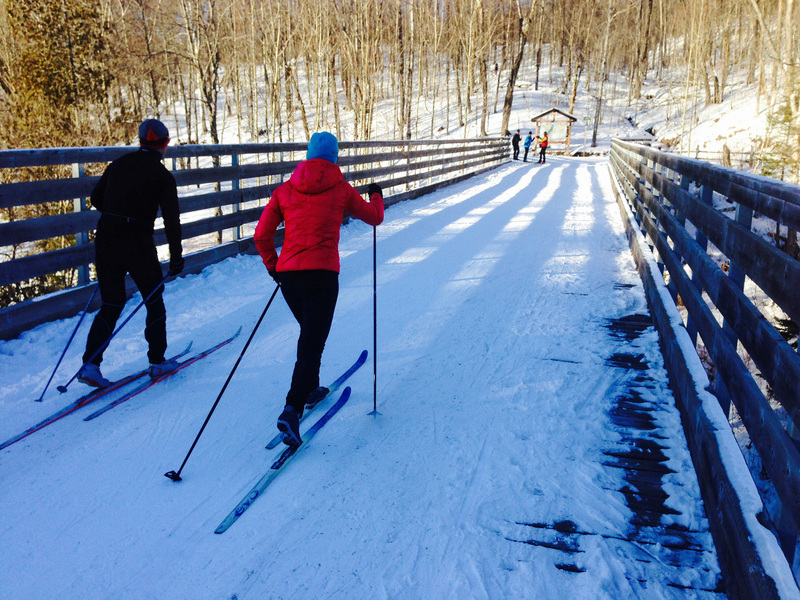 There is also a scenic riverside run, several heated refuges and – in keeping with French-Canadian mystique – lots of locals stopping on the trail to chat with friends. 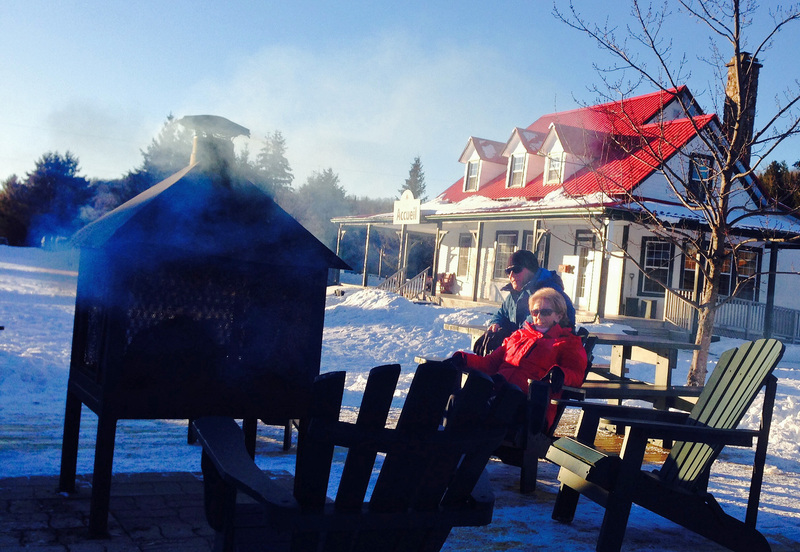 A half-hour down the road, the charming village of Val-David offers even more cross-country opportunities. But the best thing about French-Canadian skiing? The American dollar. At the time of this publication, $1 U.S. bought $1.42 Canadian – bad news for the Canucks but great value for us. With tickets already reasonable compared to prices at top resorts in America, Tremblant is a place where you can really stretch your dollar. That’s assuming you don’t spend it all at the casino. 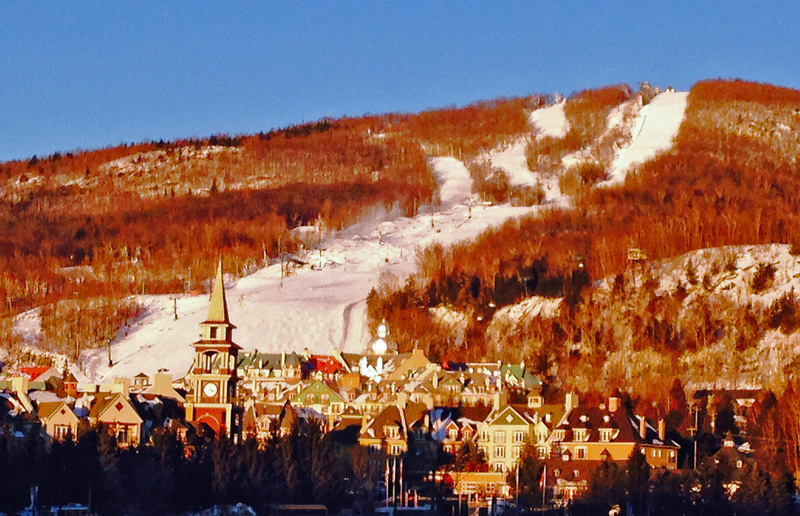 Like most large ski areas, Tremblant is now a year-round resort. Summer has music festivals, from blues to world, and an epic, five-kilometer zip line that takes sliders down from the summit, approaching speeds best achieved by departing aircraft.